H. Wilson Company announces the arrival of the WPSDD2 Mobile Multimedia Workstation --ideal for presenters and educators. The new Mobile Multimedia Center is incredibly versatile, with multiple surfaces, shelves and a locking cabinet that ensures security for all of your presentation tools. 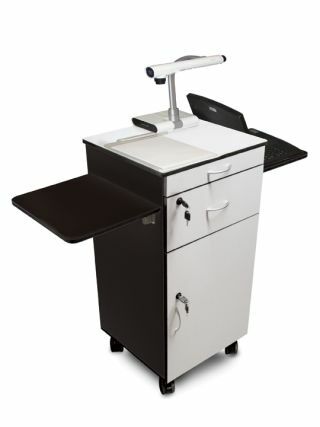 This sturdy multimedia station includes an easy glide laptop shelf, two drop leaf shelves for your notes and other presentation equipment. Valuable audio visual equipment will be secure in the lockable cabinet, that includes an adjustable, or even removable shelf. Constructed from a durable laminate finish.